Panguni Uthiram is an important and an auspicious day for the Tamil Hindus. It is observed in the month of Panguni (also known as Phalguni) when Nakshatram (Star) Uthiram or Uttara Phalguni prevails. Panguni is the twelfth and last month in the Tamil Calendar and is also known as Meena month in other solar calendars. On this day, it is believed that most divine marriages took place. The marriage of Goddess Parvati and Lord Shiva, Goddess Deivayanai and Lord Murugan, Goddess Sita and Lord Rama was conducted on Panguni Uthiram day. This day is also known as Mahalakshmi Jayanti as on this day Goddess Mahalakshmi incarnated on the Earth during legendry churning of the Milky Ocean. The Churning of the Milky Ocean is also known as Ksheera Sagara Manthan. Let’s take a look at the Panguni Uthiram celebrations at the Srirangam Temple (also known as Bhoologa Vaikundam) which is very elaborate, noteworthy and particularly well attended. 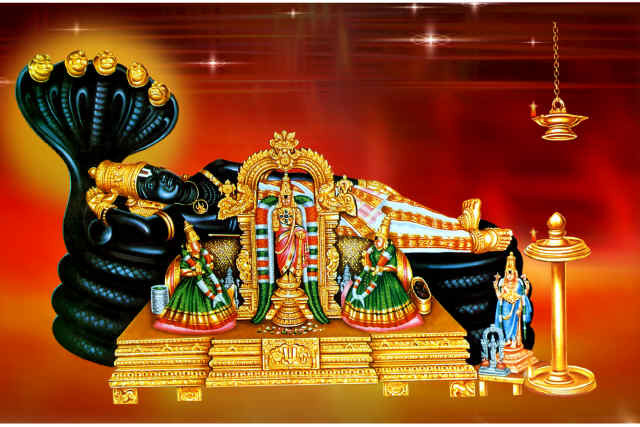 Once a year on Panguni Uthiram, when the star Uthiram is in ascension, Divya dhampathigal (the divine couple), the Lord Ranganatha and Thayar, come together for a day. The day falls sometime in the months of March or April. The Divya Dampathi’s Darshan on this Day is called “Serthi Sevai.” In Tamil, ‘Serthi’ means alongside or together and ‘Sevai’ is Darshan. 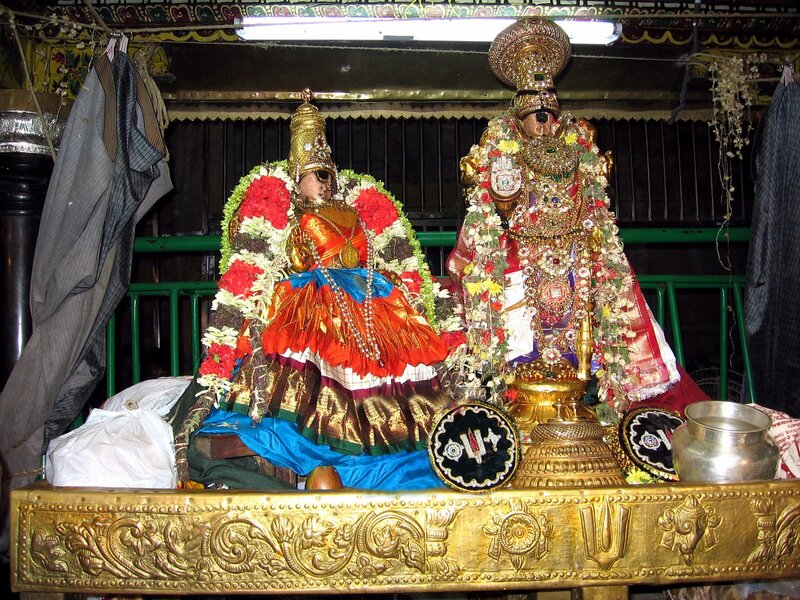 Ranganayaki, is the presiding Goddess of Ranganatha at the Srirangam Temple. She is affectionately called Thayar (“Divine Mother” in Tamil) and is the consort of Lord Ranganatha, who is the Lord deity of Srirangam. She is regarded as the manifestation of Lakshmi. She is also called Ranga NAchiar. Ranganayaki is held in high reverence by the by Vaishnavites. Acharyas that sang the grace of Ranganatha venerate her. There is an interesting side story that leads us to the main celebrations on this day, Panguni Uthiram, at the Srirangam Temple. Srirangam is located between the two famous rivers – Cauvery and Coloroon – and spread over 150 acres, is Ranganatha Swamy Temple in Srirangam. 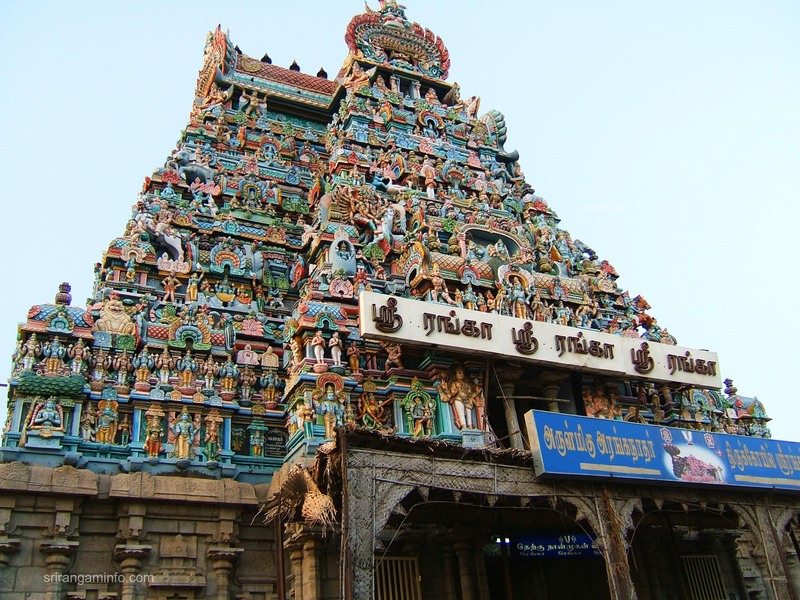 It is considered the most sacred among Divya Desams (First of the 108 Divya desams, the Vishnu temples praised by the 12 saint poets called Azhvaars). This place is also called Bhoologa Vaikuntam (heaven on earth). 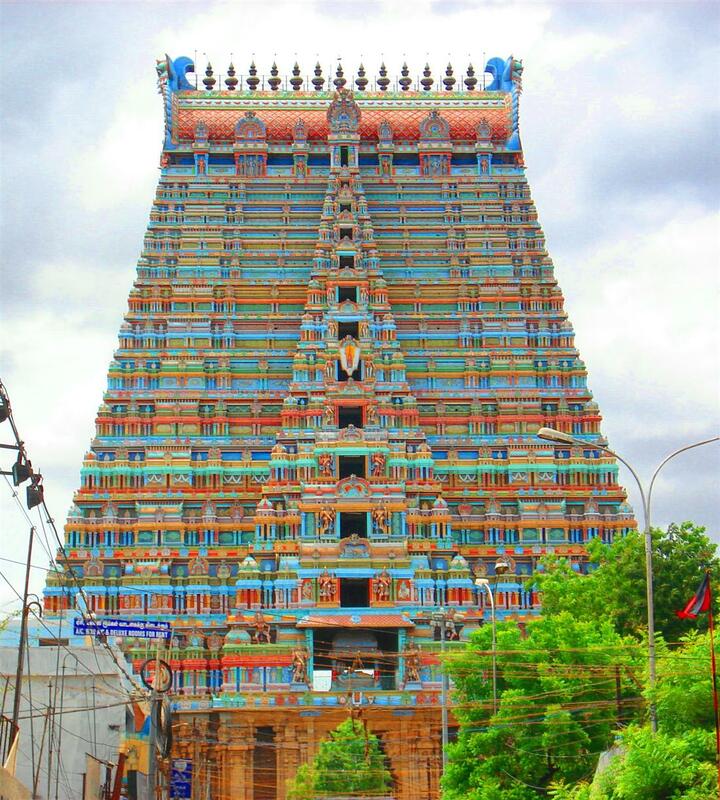 There are 21 towers in this temple and the biggest temple tower in Asia (236ft) is at Srirangam. Sometime in March/April every year a few days before the Panguni Uthiram day, Lord Ranganatha of Srirangam travels across the Cauvery to meet his beloved Goddess Kamalavalli in Uraiyur (Trichy). A few days later, in the same week, at the Srirangam temple, one can witness the event of Goddess Ranganayaki shutting the door on Lord Ranganatha for having visited Goddess Kamalavalli and having gifted her his ring. Uraiyur was the first capital of the Chozhas and is also the birth place of Thiruppaan Azhvaar who composed 10 famous verses on Lord Ranganatha called Amalanaathipiraan. Uraiyur temple is built in memory of goddess Kamalavalli’s love for Lord Ranganatha. The story goes that Chozha king Nanda Chozhan was childless. Pleased with his prayers, Lord Ranganatha asked Goddess Lakshmi to be born as the King’s daughter at Uraiyur. Being born from a lotus, the Goddess at Uraiyur is called “Kamalavalli”. As years went by, Kamalavalli grew up into a beautiful young girl. One day, while she was playing with her friends, her eyes fell on Lord Ranganatha of Srirangam, and fell in love with him instantly. King Nanda Chozhan was in a fix as his daughter had fallen in love with the man, who had blessed the King with the child. The Lord accepted the King’s prayers and agreed to take her as his bride. Delighted at this, Nanda Chozhan built the temple at Uraiyur to celebrate it. 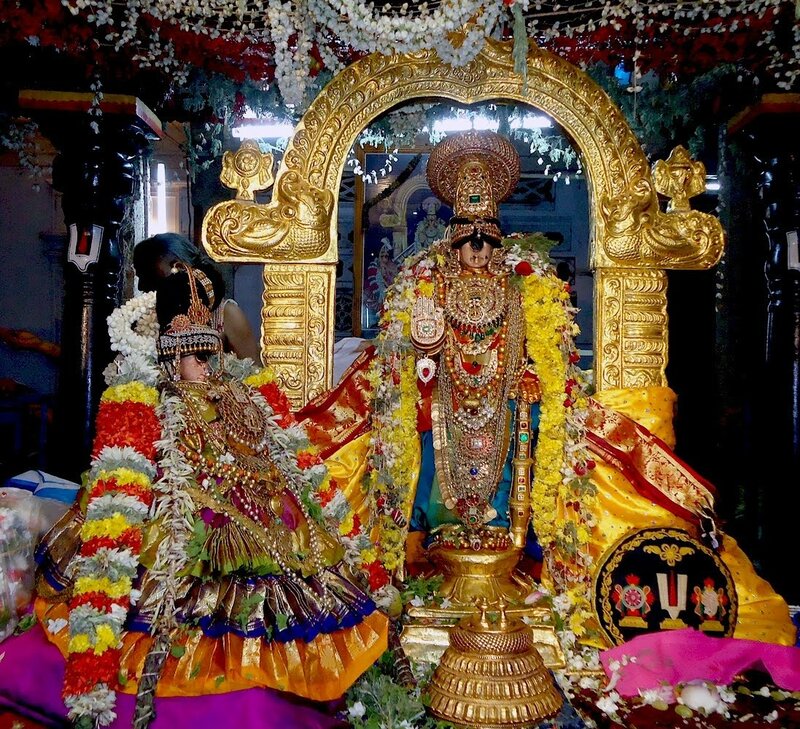 A few days before the special day, Lord NamPerumal (Ranganatha), the Utsavar deity of Srirangam temple, in all his splendour, will leave Srirangam at 4 am and cross the river Cauvery in a golden palanquin to meet his beloved goddess Kamalavalli for the Kalyana Utsav (marriage festivities). 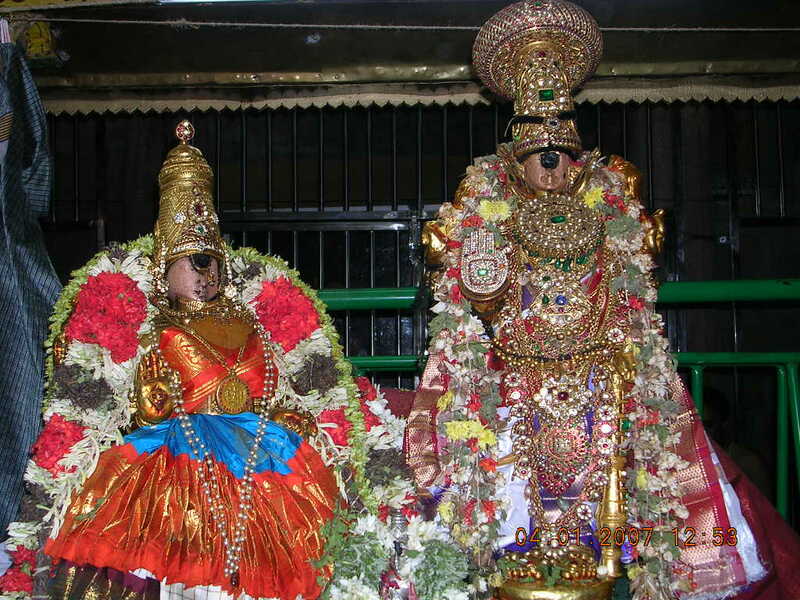 On this auspicious day in the Tamil month of Panguni (mid March-mid April), the entire marriage formalities between Lord Ranganatha and Goddess Kamalavalli will be enacted at the Uraiyur temple. Here, one can see Kamalavalli in a grand sitting posture all set to get married. A unique feature of this temple is that this is the only Divya Desam (out of the 108) where the Goddess is facing the Northern direction or in the direction of the Srirangam Ranganatha temple. After the marriage festivities are enacted, Lord Ranganatha will take the trip back to Srirangam across the Cauvery that same night at 1.30 am. The story goes that Goddess Ranganayaki of Srirangam came to know about the Lord’s trip to Uraiyur as his clothes are soiled with slush. Upon questioning the Lord sheepishly gives excuses and this angered Goddess Ranganayaki. A couple of days after his return from Uraiyur, on the occasion of Panguni Uthiram, the Lord visits the Goddess at her Sannidhi to pacify her. With the temple elephant leading the way and hundreds of temple priests chanting the Naalaayira Divya Prabhandham (4000 songs of the Azhvaars), the Lord goes from house to house asking for money to buy a ring so that the Goddess doesn’t come to know that he has presented his ring to Goddess Kamalavalli. After over three hours on the street in the hot summer sun, the Lord reaches the Sannidhi of Goddess Ranganayaki. Goddess Ranganayaki shuts the door on the Lord and refuses to allow him entry into the Sannidhi. Despite his repeated attempts to force his way into the Sannidhi, the door is shut on the Lord. For the next couple of hours, there is a war of words between Lord Ranganatha and Goddess Ranganaayaki (re-enacted by the priests from both the sides) and even throwing of things by Goddess at the Lord. This is a great sight and re-enacted with much gusto. It is then that NammAzhvaar, the greatest of the Azhvaars, is brought in to settle this fight. NammAzhvaar advises the Goddess not to insult the Lord and to save him from further embarrassment. After this intense debate, Goddess Ranganayaki finally relents. With the debate ending successfully, the Lord enters the Sannidhi of the Goddess, goes to the Serthi Mandap and is seen together with the Goddess for the rest of the day and night. In the second composition called ‘Ranga Gadhya,’ he sings in praise of Lord Ranganatha and shares to the world the many virtues of the Lord. In the third composition, called ‘Vaikunta Gadhya,’ Ramanuja, in a glorious description, brings to light the great things and the divine world of Vaikunta. 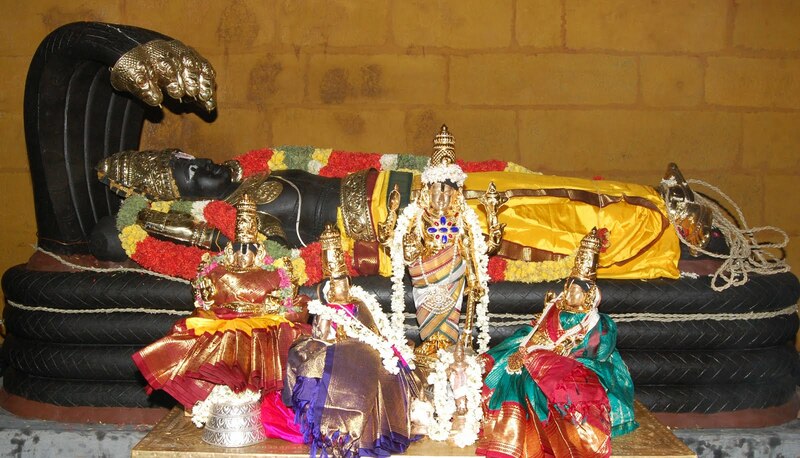 In memory of his contributions, these three compositions of Ramanuja are rendered in front of the Serthi Mandapam at around midnight on the Panguni Uthiram night with Namperumal adorned with 18 different alankarams. At the end of the festivities, the Lord is taken out in a procession on a chariot through the four Uthira streets, before being taken back to his sanctum. This is the only day in the year where Lord Ranganatha and Goddess Ranganayaki are seen together and hence considered a sacred occasion. There are special poojas performed through the day and night for the Lord and the Goddess. At around 5.45 am the next morning, Lord Ranganatha bids goodbye to her. It is believed that a visit to Srirangam temple on the Panguni Uthiram day is said to relieve one of all sins and the Lord and the goddess are said to forgive devotees for all their wrongs. The Temple is visited by many devotees from across the country. In the Varadarajaswami Temple in Kanchipuram, the Panguni Pallava Utsavam lasts for seven days when the sacred text Hastigiri Mahatmyam (the sthala-Purana of this temple) is read in the 100 pillared mandapa in front of the deity. The Panguni Utsavam is a unique festival in this temple lasts for seven days and culminates on the Uthiram day with the marriage of Goddess Malayala Nachiyar or Serakula Nachiyar to the Lord. People throng in thousands to witness this divine marriage. An epigraph of 1582 A.D. of the reign of the Vijayanagara monarch Sriranga Raya mentions an endowment for offerings to be made during this festival which is specially called Serakula-Nachiyar Panguni Uthiram Sathumurai. The images of Serakula Nachiyar and Senai Mudaliyar (Vishvaksena) are taken in procession to a garden named Dalavaya Toppu where offerings were made. The festival is also associated with various rituals. For instance, devotees carry a kavadi (semicircular canopy supported by a wooden rod that is carried on shoulders), milk pots or pull a chariot in fulfilment of vows. A special feature is the alagu, where devotees pierce the body with spears and hooks as an offering to the Lord for having helped them to avert a calamity. In the Ahananuru, a Tamil work of the Sangam period (III C B.C. – III C A.D.), there is a mention about a festival in Panguni which is equated to Uthira Vizha. Shakti Uma Devi performed puja for the Lord in the form of Devi Kamakshi. At the end, the wedding of Siva and Shakti took place here as prayed for by the celestials. An inscription on a gopuram of the Kamakshi Amman temple in Kanchipuram mentions a gift of two villages for Puja on the occasion of the Panguni Utsavam. 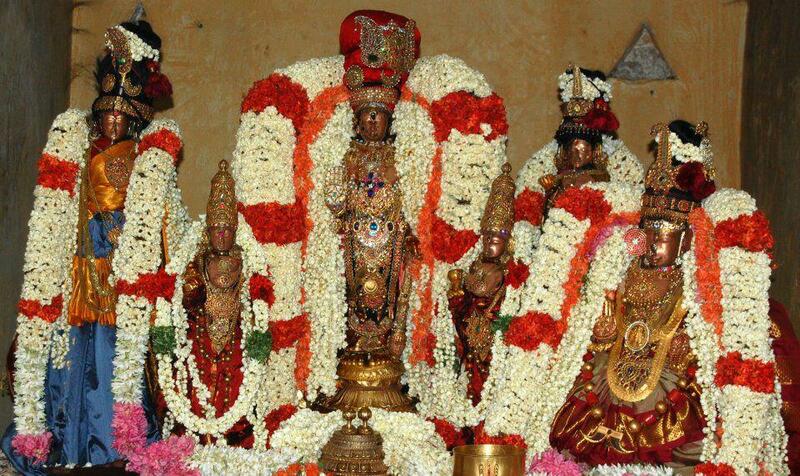 The festival is exceptionally celebrated at Sri Kapaleeswarar Temple. The temple organises a big procession of the 63 Nayanmars during the eighth day of the Panguni festival. 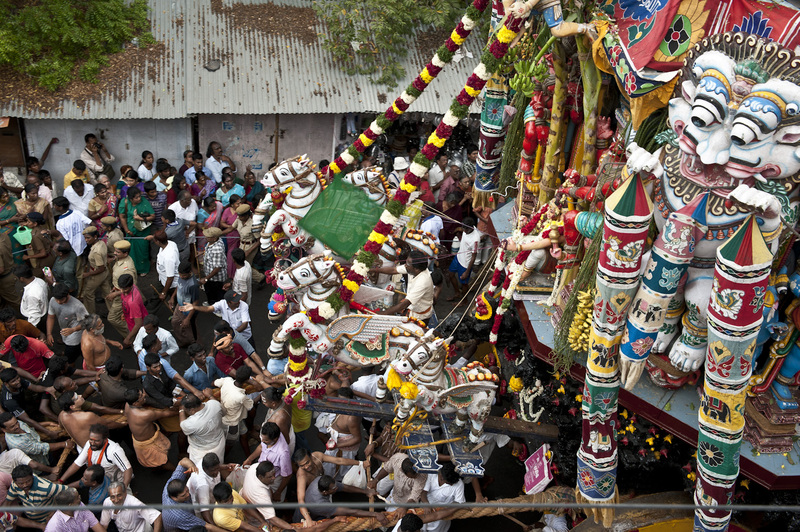 The unique aspect of the procession is that as the palanquin of Lord Kapaleeswarar moves forward, those of the Nayanmars will move backwards, facing the deity. Also the deities in the procession will be brought in groups — (Karaikal Ammaiyar; Mangaiyarkarasi; Isaignani) the women’s group; Appar, Sundarar, Manickavasagar; Gnanasambandar and Poompaavai; to name a few. 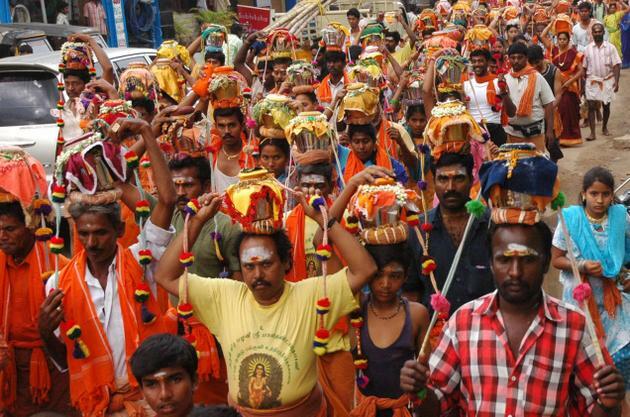 Another unique aspect of the procession is that deities from other temples such as Kolavizhi, Vairamudi Swami, Mundakakanni Amman, Thiruvalluvar Vasuki and others take part. It is thus a community event of the deities. Panguni Uthiram is also a day when Deivayanai married Lord Subramanya on this day, it is an important festival for Lord Subramanya devotees. On this day, devotees flock in hundreds to all Murugan temples. It is believed that Goddess Parvati in the form of Gowri married Lord Shiva in Kanchipuram and because of this belief this day is also celebrated as Gowri Kalyanam day. This day is also celebrated as Lord Ayyappan Jayanti. In summary, Panguni Uthiram is one of the divine days in the Tamil Hindu Calendar, a day when the Gods are in their benevolent best to bless the Devotees. Thank you for the wonderful commentary Sridhar. God bless you on this Divine Day. Thank you Vatsala! Hari Om! Thank you Hema Malini! Hari Om!